If you haven’t bought a new mattress in years, the thought of purchasing a new luxury mattress might be quite exciting. Owning a mattress that’s extremely comfortable can change the way you sleep. If you’re someone who has trouble sleeping on your current mattress, a new mattress is a small price to pay if it results in you being able to get a good night’s rest. Most of our readers understand how expensive mattresses can be – you can pay over $5,000 for a high-end mattress in a department store. But times are changing – there are plenty of new mattress manufacturers that produce low-cost mattresses that provide high levels of comfort. If you want to buy a cheaper mattress, you won’t have to settle for a traditional spring mattress. You can find high-end foam mattresses for just a few hundred dollars online. One new company that has proven very successful with consumers is Layla mattress. They’re not as cheap as some of the other new market entrants, but they do have great prices. For the purpose of this review, we’ll be taking at Layla’s only mattress – the Layla Mattress can be flipped for different levels of firmness. This feature isn’t found many other places. If you’re considering purchasing this mattress, this review will be a great resource for you. Make sure to read all the information if you’d like to be as informed as possible! Once you decide to research a mattress, one of the most important things to consider is the way that it’s constructed. You don’t want to purchase a mattress without understanding the materials used to create it. The Layla Mattress construction is extremely complex – the company uses a variety of materials and layers to get the most out of the mattress. This mattress is reversible – you can sleep on either side of it. Each side has a different firmness level, which means that you can sleep on the side that corresponds to how much support you’re looking for. In this section, we’ll take a deeper look at how this unique mattress is manufactured. It will give you a much better understanding of what you’re purchasing. This layer is for the most comfortable side of the mattress. It consists of 3” of copper infused memory foam. This memory foam allows for a sinking feeling – it gives you the impression that you’re sleeping on a cloud. There is plenty of hug and contour provided on this side of the mattress. This is the layer that provides transition to the support layer of the mattress. This layer is made from 2” of poly foam. 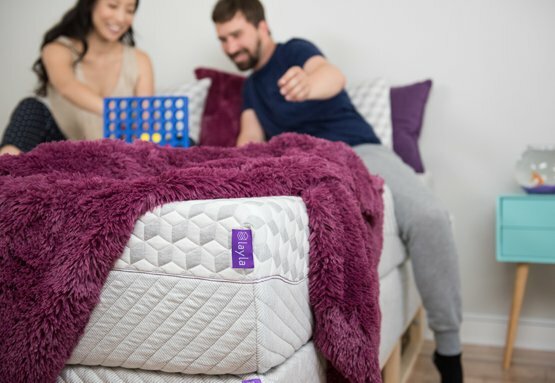 The best part about this layer of the mattress is its egg crate design – it allows for a breathability to keep the mattress cool while you’re sleeping. The support layer is what ensures the mattress provides you with the firmness you need to enjoy a good sleep. Without this layer, you’d sink through the whole mattress. This layer is made from a large amount of high-density poly foam. This is the bottom layer of the mattress, but it can also be the top layer if you want something firmer. This is made from 1” of copper infused memory foam – it’s much thinner than the same memory foam on the other side of the mattress. This layer is for the person who prefers to have a more supportive sleep. The cover of the Layla Mattress can be removed to wash and clean whenever you please. It’s made form a polyester blended with gel – this allows the mattress to breathe better while you sleep. It’s a great addition to this already exceptional mattress. This section is dedicated to the most important components of any mattress – how it feels and how much support it offers. This discussion will depend on the side of the mattress that you’re looking to sleep on. First, we will discuss the soft side of the mattress. This side of the mattress is extremely comfortable. It’s slowly eases down as you sleep on it, creating a nice contour around your body – it’s what you expect from a high-end memory foam mattress. In terms of support, we’ve rated this mattress at around a 5.5/10. It’s great for those who don’t need to much support. This being said, if you weigh more than average you might prefer the other side of the bed. The firm side of the mattress has much less memory foam, so there isn’t as much contour when you lie on the bed. We’ve rated this side a 7/10 – it’s much firmer than the other side, but not as firm as you might want if you’re looking for something extra-supportive. In terms of hear retention, the egg carton shaped transition layer allows the mattress to breathe well. Sinkage on the Layla Mattress depends on the side of the mattress that you’re testing. To test sinkage levels, we place concentrated weights on the mattress to see how far they sink in. We did this for both side of the mattress. The tests are below. This side of the mattress is the side that provides the most comfort. A 5-lb. weight on the mattress provided 1.5” of sinkage. A 10-lb weight caused 2.5” of sinkage. A 100-lb weight caused 6.5” of sinkage. This is the side you sleep on if you want more support. A 5-lb. weight on the mattress provided 1” of sinkage. A 10-lb weight caused 2” of sinkage. A 100-lb weight caused 6.5” of sinkage. Don’t ever purchase a mattress just because it’s comfortable or has great support – there’s much more that needs to go into your decision. With so many mattress companies to choose from, mattress firms have invested in providing additional benefits and features for their customers. These features can end up saving you a significant amount of money in certain circumstances, so they’re very important to consider. Don’t settle for a mattress that doesn’t come with additional benefits. There are too many competitors in the market for you to need to purchase as sub-par mattress. At the end of the day, you should only purchase a mattress if it has an industry standard warranty and trial period. In this section of the article, we’ll take a look at all the additional benefits you can expect to receive if you purchase a Layla Mattress. Make sure to consider all of them before making any purchasing decisions. This is probably the most important of the additional benefits or details. If you want to purchase a new mattress, you need to be sure it has a decent warranty. A mattress is a long-term investment, don’t put yourself in a situation where you end up having to replace a faulty mattress because it’s not covered. The industry standard for a mattress warranty tends to be around 10-15 years, while some can be much shorter. With Layla, the warranty you receive is a lifetime warranty – you can replace the mattress if there are any issues with the mattress during the lifetime of the mattress. This is an amazing benefit that you will only find with a handful of mattress producers. In terms of warranties, it doesn’t get any better than this. If you’re someone who wants to be certain you’re protected from faults in your mattress, this is a great company to work with. It’s important to consider that the warranty will only be valid if the company is still operational – you are betting on the future health of the company when you rely on a warranty. All Layla Mattresses come with free shipping. This is a huge benefit considering how expensive it can be to deliver a mattress. Because the mattress is foam, it comes condensed in a box – when you open the box it will expand into its functional size. This benefit is one that can end up saving you hundreds of dollars. Many mattress companies will make you pay for shipping, which inflates the true cost of the mattress drastically. If you want to be certain you’re getting good value, try and find mattress producers with free shipping. This is another of the most important benefits associated with the Layla Mattress. Because you have to order the Layla Mattress online, it’s hard to find out if you truly want the mattress until you buy it. This creates a bit of a problem – you don’t want to invest blindly in a product that you haven’t tried yourself. Fortunately, Layla Mattress provides you with a 120-day trial that allows you to sleep on the mattress for around four months before deciding if you want it. If you do decide it’s not right for you, the mattress can be returned completely free of charge. This is even better than seeing the mattress in a showroom. You’ll be able to get a true feel for the mattress before you make a decision. Layla has a great customer service team on-hand to help you with any issues with their products. This might sound like something you should expect, but it’s actually rare with a lot of mattress companies. Because mattress companies are trying to cut costs, they often reduce the amount of effort they put into their post-purchase customer care. At Layla Mattress, you’ll be able to get in contact with their customer care team very easily. If you’re someone who wants to be assured you can speak with customer service representatives, this is always a nice option. If you head to their site, you’ll find a live chat portal at the bottom left-hand side of the page. You can use this live chat portal to speak with customer care when you need help – it’s very convenient! This will only be touched briefly, as it has been mentioned previously, but this is one of the only mattresses on the market that allows you to benefit from two different support levels. This means that you can change the side of the mattress depending on the type of surface you’re looking for! All Layla mattresses are made right here in the USA. By purchasing a Layla Mattress, you’re supporting local industries and workers. The last feature that should also be taken into consideration is all the other products that Layla has to offer. They also make pillows, bed stands, toppers, and foundations. This means that you can match your current mattress up with products made from similar materials. It’s an easy and convenient way to keep everything under one manufacturer. Should I Buy the Layla Mattress? If you’re looking for a relatively affordable mattress that provides plenty of benefits, this is always a good option. The fact that you can turn the mattress over to utilize a different comfort level is a huge benefit to those who want to get more out of their mattress. The mattress is also very breathable considering it is a memory foam mattress, so it’s great for those who want to avoid overheating while they sleep. The lifetime warranty and long trial period also ensure you can try the mattress without having to worry about something going wrong. If you still feel you don’t want this mattress, make sure to check out some of other reviews on our site – we overview a range of different mattresses and their manufacturers.